Sharing a favorite with you! 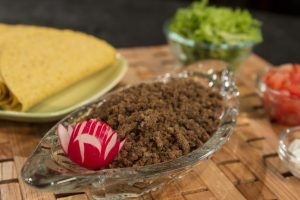 A great ground beef substitute and/or extender made from bulgur wheat. Place the bulgur wheat in a saucepan. Blend all other ingredients until smooth. Add blended ingredients into saucepan, mix with wheat, and simmer for 20 minutes, stirring occasionally. Spread mixture evenly on a sprayed cookie sheet, and bake at 250-275 degrees F. for 45-60 minutes, until it is a loose, burger-like consistency. Stir occasionally, and be careful NOT to overcook. Remove from oven while it is still moist. Store in airtight container in fridge or freeze in 1 cup portions until needed. This burger is a staple in our home. It is very versatile and saves a lot of time in the kitchen. Bake a potato and top it with this recipe and chives, and serve with a tossed salad and steamed broccoli. Try serving on a bed of brown rice smothered with spaghetti sauce. For a meal every child will love, add some tomato sauce and serve it on hamburger buns as Sloppy Joes! This one is a natural as “meat” in your spaghetti sauce, or mix it with chili beans for a really “filly” chili. The uses for this burger are almost limitless! Use your imagination.